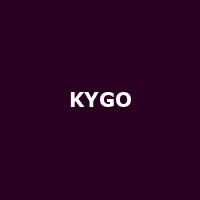 KYGO is Kyrre Gørvell-Dahll, a musician, producer and remixer from Bergen, Norway. KYGO rose to fame with his 2013 remix of "I See Fire" by Ed Sheeran, and was later asked to remix the 2014 single "Remix" from Coldplay's album "Ghost Stories". In 2015 he broke a Spotify record, hitting the one billion streams mark faster than any other artist. Solo releases include the 2013 debut single "Epsilon", plus "Firestone" (2014), "Stole the Show" and "Nothing Left" (both 2015).